British Columbia businesses can apply for several types of government funding programs aimed at fueling competitiveness. This includes funding to offset the costs of business and market expansion, capital and technology adoption, research and development, and workforce development projects. While some of these government funding programs are provided federally, those funding programs created and administered by the Province of British Columbia typically require applicants to have a Business electronic identification (BCeID) number during the application process. A Business BCeID is required to apply for many government funding programs. Companies should request a Business BCeID 3-4 weeks prior to submitting funding applications. If your business will apply for British Columbia government funding, including the BC Employer Training Grant (ETG), your first step should be to register for and access your BCeID. This will give you access to online portals where you can download and submit funding application forms. The process is relatively easy but it can take time to receive verification depending on your business. By completing the BCeID registration ahead of your funding application, it will lead to a smoother process with less waiting time. What is a British Columbia Business BCeID? There are three types of BCeIDs, including those for Business, Personal, and Basic use. To access business grants and repayable funding programs, organizations must obtain a Business BCeID; this identification number helps authorize businesses to use online funding portals which facilitate the download and submission of government funding documents. Companies must have a BCeID number to apply for government funding programs administered by the Province of British Columbia. Businesses should designate one or more employees to be responsible for managing its BCeID profile. These employees, considered to be Business Profile Managers (BPMs), can add and remove authorized users, update business information, activate subscriptions to online services, and access government funding forms. These employees must have access to the company’s BC Registry Services number to complete the process. Initial Registration: The first step in the process is mostly geared towards assigning a Business Profile Manager, inputting your business’ Registration Number (if applicable), and creating a login username/password. If your Registration Number and password/access code are available, registration can be completed entirely online. If a password or access code are not available, the BPM must verify the company with additional online, phone, or in-person assistance, which can delay the process. Registration Notification: If registration is completed online, your BCeID account will be ready to use immediately. If your information has been verified through other means, it can take up to six days to receive your BCeID and a temporary password. Upon notification of access, the Business Profile Manager can login and keep/reset the login information and begin accessing online services. Account Setup: Login to the BCeID website to setup account information. At this phase, usernames and passwords can be created for additional individuals within your organization (secondary users). Authorization Request: Go to the Online Service, click the “BCeID Sign In” button and then enter your Business BCeID and password when prompted. The first time you do this, you will be asked to complete an authorization request form — you must complete this form to become an authorized Online Service user. Accounts are typically authorized within three business days. Online Access: Once you have received e-mail notification that your account has been authorized, you may return to the Online Service, click the “BCeID Sign In” button, enter your Business BCeID and password and begin using online services. Companies that have a Registration Number and either a password or access code related to their business registration can complete the registration process in 15 minutes; however, companies requiring verification assistance may need up to three weeks or longer to register. Authorization delays are a security feature of the online system and apply to all new registrations. This delay should be noted in the context of government funding programs since there may be program-specific deadlines that applications must be received by. The Business BCeID is vital to securing government funding for your company. It’s required to access, submit, and manage applications sent for government review; without a BCeID number, your business cannot apply for provincial funds and will only be qualified to receive funding programs administered through the federal government. This significantly limits your funding potential and reduces the advantage government funding can provide to your organization. Most businesses that require a Business BCeID for funding inquire about the BC Employer Training Grant (ETG), formerly called the Canada BC Job Grant (CBCJG). The grant provides employers with up to 60-100% of training costs incurred when purchasing third-party training programs for employees. The Employer Training Grant accepts applications during defined intake periods; employers must use their BCeID to navigate the application process. Accessing Canadian government funding programs requires considerable project management and an understanding of the funding landscape. While many companies choose to go through the process independently, there are supports available to help companies find and apply for government grants and incentives. Mentor Works provides comprehensive support throughout the government funding process to ensure companies optimize their funding potential. We meet with companies to understand their strategic growth priorities and uncover funding programs to offset a portion of project expenses. Our team of Government Funding Planners can then assist the application process to reduce the time commitment and administrative burden associated with funding applications. 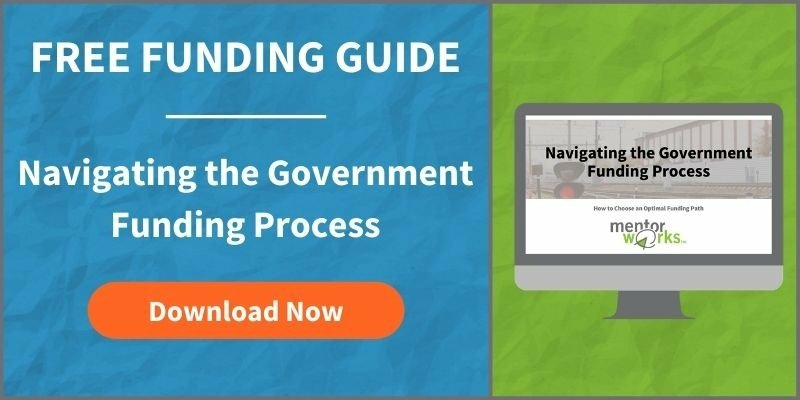 Discover how your business can access funding and optimize the application process by downloading the Navigating the Government Funding Process slide deck.